The Bronco was developed as there was a need for a light aircraft in the sixties. North American developed the type, using propeller for thrust as it would enable a longer flying time for COIN (counter insurgency) combat. It can fly as fast as 560 km/h and had a two man crew. A small cargo capability was also there with two swivelling doors at the rear end of the fuselage. It was a versatile aircraft, staring with the OV-10A. 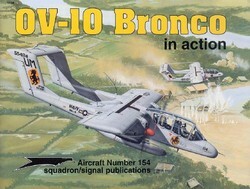 The OV-10A Bronco version was used by the USAF in Southeast Asia as a Forward Air Control (FAC) aircraft. Also the USMC used the type. 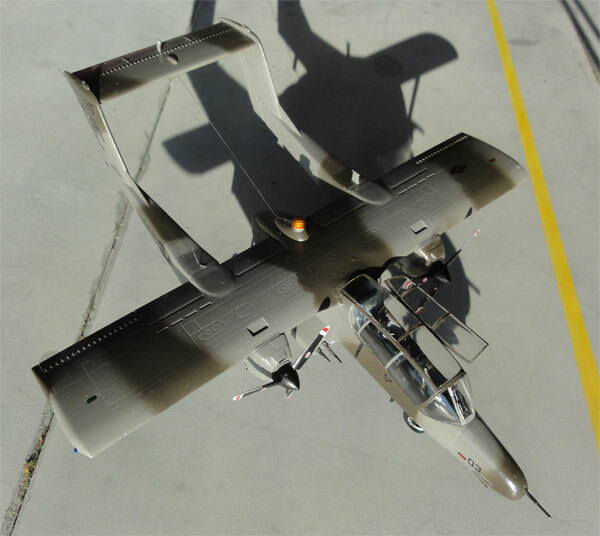 The OV-10D version got a different nose with sensors and a FLIR turret. It also got more powerful engines, composite propellers, flare and chaff dispensers in the rear booms, and other improvements. The type was used for observation purposes and to "guide" laser guided bombs dropped from other aircraft to their enemy targets in Operation Desert Storm (Iraq). Night surveillance tasks were regularly done by these Bronco's. The 1/72 kit used here in the Academy kit no. 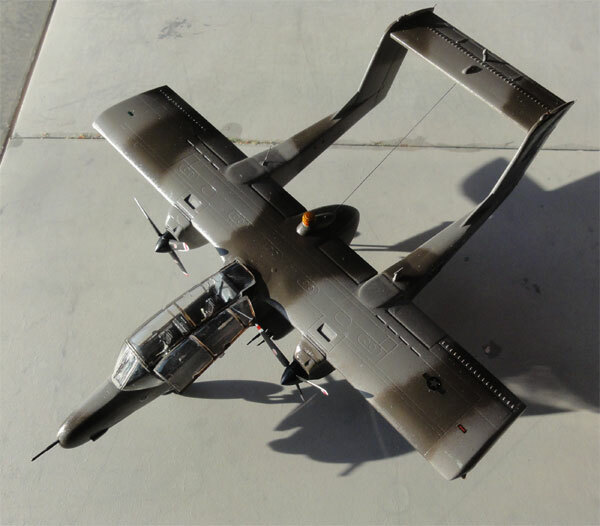 1680 (FA205) for the OV-10D as used in "desert storm". The kit was first issued in year 2002. 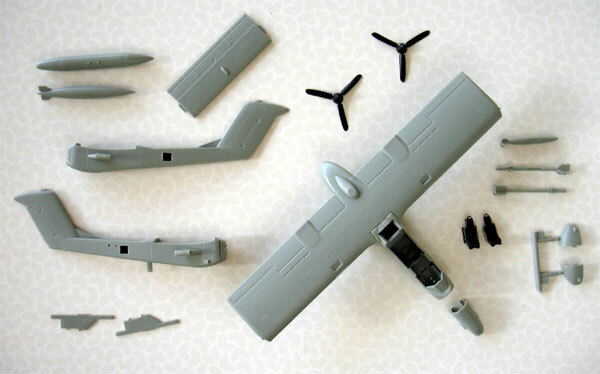 The about 50 airframe plastic parts are in light grey/green and are fine but average. Panellines are few but inscribed. The windows are very clear. 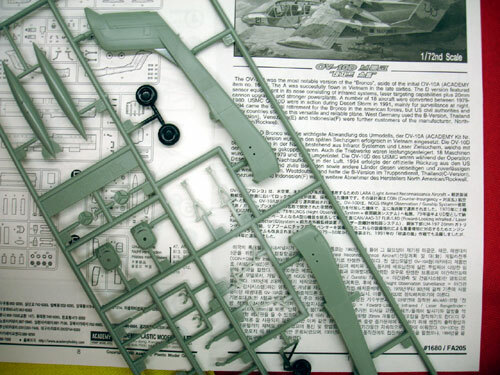 The very old Airfix 1/72 kit had very inaccurately shaped greenhouse windows besides being very a rudimentary kit. 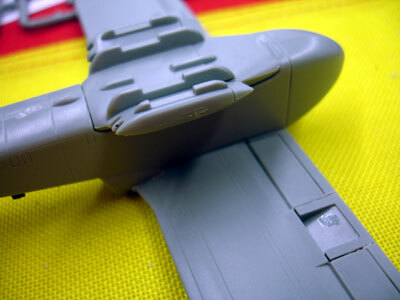 More than 20 years ago I even made a new canopy for this kit using the "plug" method. Those days are over with the new Academy kits. 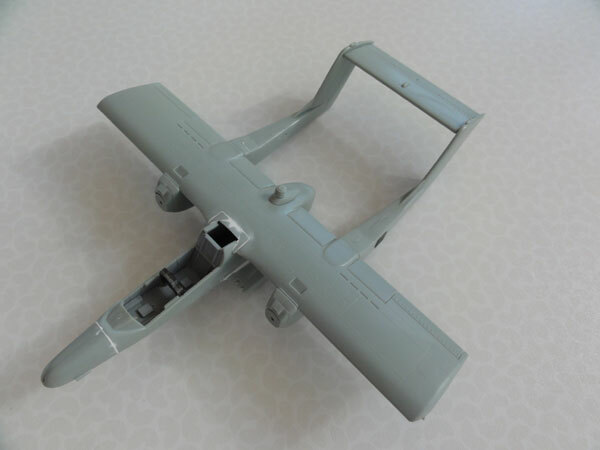 In this OV-10D kit stores comprise about 30 parts for LAU-10 rocket pods, LAU-3 rocket pods, fuel tanks and even some Mk.82 bombs of 500 lb bombs and AIM-9 Sidewinders !! Below the fuselage are the typical two fairings. 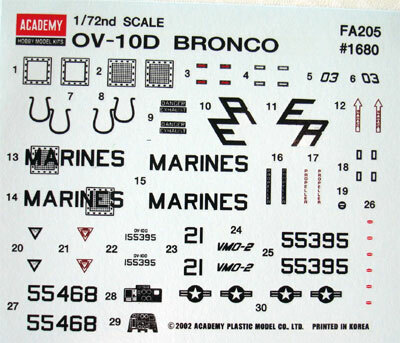 Decals are for VMO-1 and VMO-2 USMC Bronco's in a desert sand colour scheme in the kit. 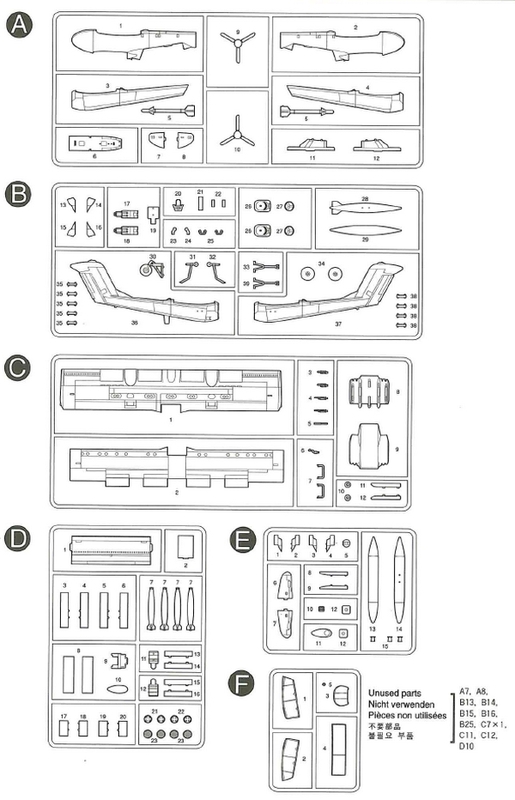 Various model aftermarket sets particularly for the interiors are available (CMK , Eduard), but this kit will be build straight out of the box. 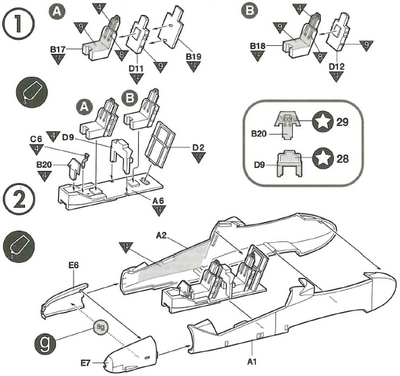 Assembly is very straight forward as per instructions. 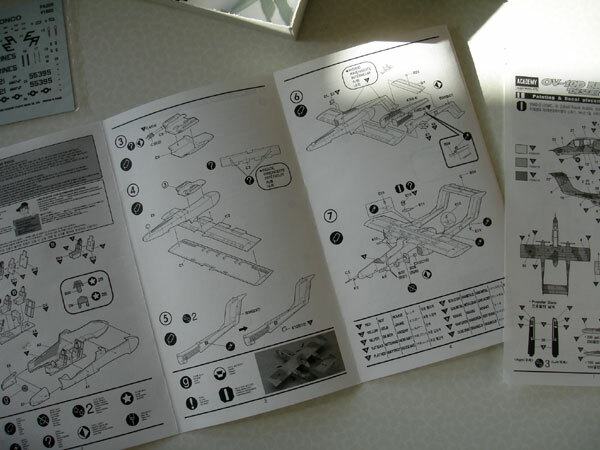 The seats are on the real aircraft handed so the rear sections are not completely correct, but I left it was per kit. For the instruments basic decals are provided but they need some trimming. The cockpit is OK but will benefit from adding some more detail like seat straps and so on, will be done later. 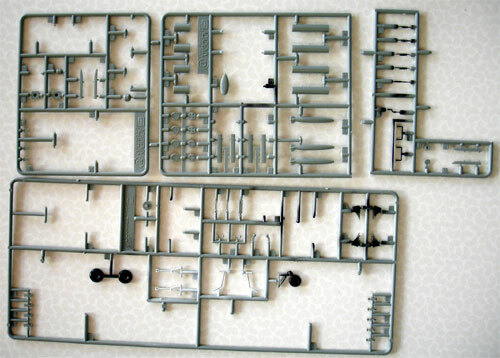 The main sub-assemblies... 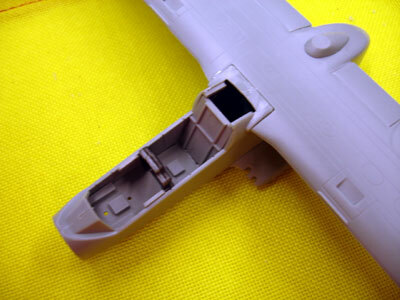 Note the extra nose parts for an earlier Bronco are also in the kit. NOSE WEIGHT is needed inside as well. 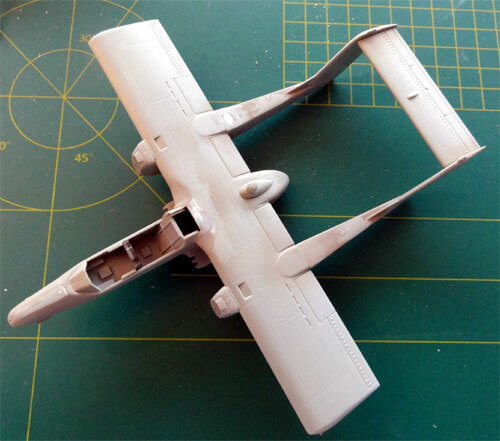 Filler was needed in some spots like the forward wing-fuselage joint, nose and the engine nacelles. The fillets at the tail are a bit too flat. Ready to get the needed paint coats. The scheme #2 straight from the kit was picked, of VOM-1 USMC based in Saudi Arabia during Desert Storm in 1991. It has tail code "EA"
FS34064, for which Xtracolour X241 enamel was used. Painting the propeller blades was a lot of work. 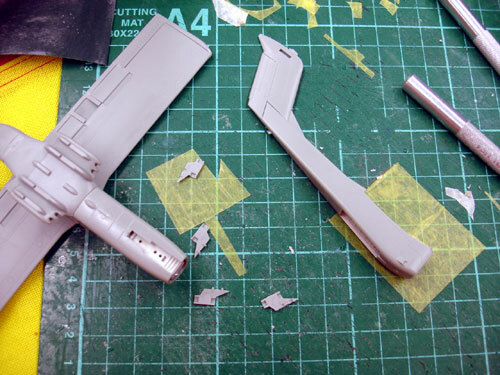 The infrared suppressor got a coat of aluminium with also Tamiya transparant orange. The paints were rather glossy, so the decals could be applied straight away. Decal 1 / 2 required DACO softening fluid to get it droop over the panels. The canopy frames were handpainted and fitted. The upper roof part F4 needed removal of about 1 mm at the rear to fit better. 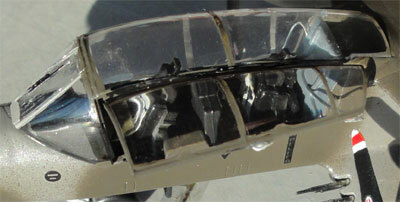 White glue was used to close any gaps in the canopy, with one panel set open. When dry, paint in the appropriate colour. 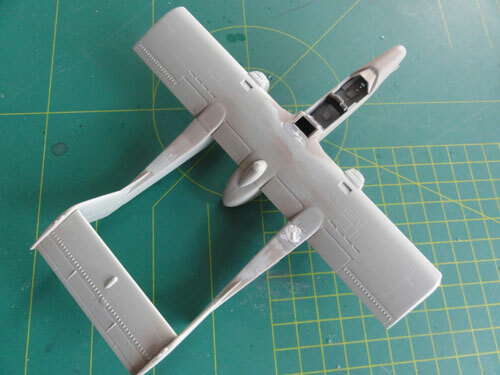 Antenna wires were added on and below each tail boom and a longer wire from fishing line between the fuselage end and the tailplane. The model got a semi-matt coat was sprayed onto the model, through a mix of Johnson Future/Pledge varnish with say 10% Tamiya X-21 flat base acrylic matting agent. It will also protect the decals. That completed this nice little Bronco model.